POS Check Viewer is a handy tool which allows you to quickly search for and display the contents of a check created on the Micros RES 3700. Need to query the contents of a customers bill quickly? Don't want to scroll through days worth of Micros journals to find what you are looking for? Want to spot check what your employees are doing on their bills? Employee Name - both first and last names. A combination of the above. eg. First Name and Business Date. The Micros Database stores check detail for 14 days. You can search for checks within the past 14 days. 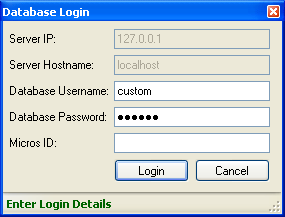 A connection is made to the Adaptive Server Anywhere database using the login credentials supplied on the login screen. See the screenshot on the right. The program comes with a default username and password configured which should work on 99% of all Micros databases. If these login credentials do not work for you then you will need to supply valid credentials. These can be supplied by your Micros representative. A second level of security id added in the form of the PC Application ID that can be assigned to an employee in the Micros POS Configurator -> Employees -> Security tab. A valid id must be supplied in order to login.